Vancouver’s thirteen-year tradition of artistic mash-up plays to a packed house at The Western Front. This marks the 13th consecutive year of Spatial Poetics, a celebration of cross-disciplinary artistic collaboration that heralds the beginning of the annual Powell Street Festival. For more than a decade, this event has mashed-up local artists of diverse interests, approaches, and specializations to createnew works based on the adventure inherent in the seemingly happenstance combination of talent. Spatial Poetics XIII: “WeMix” is curated by YACTAC (The Young Asian-Canadian Twins Artists Collective), comprised of Janice and Justine Cheung and Peggy and Karen Ngan. This is YACTAC’s second spin coordinating the Spatial Poetics performances, having taken-charge of the 2009 production.The Western Front plays host, the door is by-donation, and the house is enthusiastic and full. This year’s program presents collaborations forged solidly within each artist’s established expertise, rather than on pushing the collaborators outside their zones of comfort and experience, as often has been the case in Spatial Poetics performances in years past. 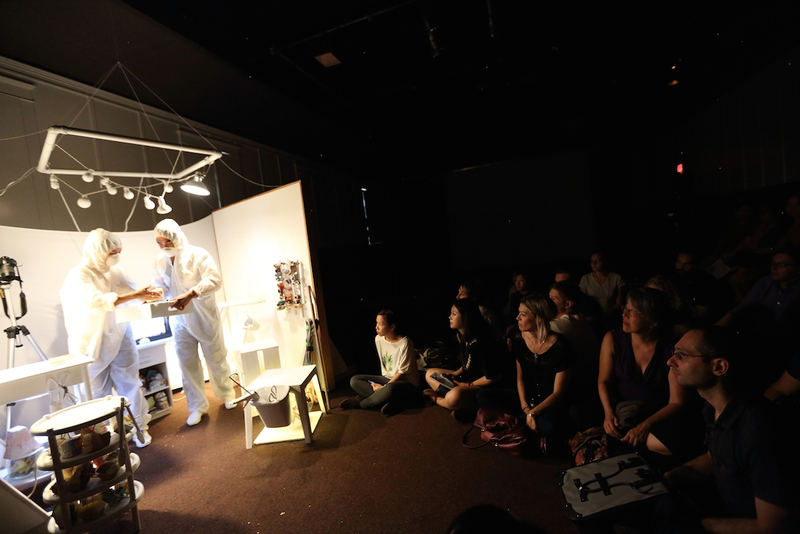 Two of the pieces – Better Living Subdivision and Rendering Translations – are explicitly self-referential in their exploration of interdisciplinary artistic collaboration; the third – Seasons of Rebirth, Transformation and Change – places diverse talents into a more orthodox combined performance. Hooded, dust-masked, and enshrouded in hazmat suits, Kuh Del Rosario and Ryan Romero work throughout the duration of the evening’s performances in a gleaming white set that evokes clean-room sterility within a Terry Gilliamesque aesthetic of screwy techno-whimsy. Their task? “Mass production” of unique sculptural art pieces that one might say falls at the intersection of Del Rosaio’s visual art practice and Romero’s brand-oriented graphic design work. With high theatricality and deadpan, unspoken good humour, these two cogs in the artistic industrial complex work diligently through their shift to combine the very finest ingredients – cardboard slabs (“SLABS!”), foam blocks (“FOAM!”), and paper rings (“HOOPS!”) – into the products that will satisfy consumer demand for art. Each piece is constructed in assembly-line fashion, components passing back and forth between the indistinguishable art-workers. It is then inspected for quality control, catalogued, placed within appropriately excessive product packaging, and added to inventory. After the performance, the pieces are available for purchase on a pay-as-you-wish basis – proving, yet again, that the least functional, least certain, least sustainable aspect of our dysfunctional, uncertain, and unevenly-sustainable system for supporting artists is the “support” part. The commodity fetishism of market-economy orthodoxy does not work for artistic modes of production. This piece explores and tests the bonds of interdisciplinary collaboration by setting-up an elaborate artistic feedback-loop. Multi-talented performance and plastic artist Patrick Cruz doodles (drawing, copying, cutting, pasting, and rescaling) on a large projection screen using a simple laptop “paint” app. The Surrey New Orchestra — Franco Maravilla, Miguel Maravilla, Charity Cruz – translate Cruz’s ever-shifting three-colour image into an improvised score, which Michelle Lui then interprets in real-time as dance. The circle is completed as Cruz takes the inspiration for his graphics from the forms and movement of Lui. The strength of this performance lies in both the concept and the considerable skills of each of the artists. If there is a weakness, it is in the frequently facile and tenuous nature of the linkages from one medium to the next. But this is hardly a flaw in the work. To the contrary, the simplistic translation of image to sound correctly and appropriately highlights the seduction and peril of attempting to translate ideas and emotions from one artistic medium to another. The sometimes tight, sometimes sketchy relationship between the dance movement and the music extempore illustrates both the intimate and conventional relationship between these forms and the challenges in being the fourth link in an improvisational chain, asked to interpret not just the spontaneity of a single musician, but the agglomerated sound of three musicians each struggling to both find a voice and combine that voice with those of the others. The seeming remoteness between Lui’s movements and Cruz’s images highlight the temporal disconnect between the immediacy of the dance performance and the process-durational nature of image creation. As with any well-designed experiment, the points of failure are as illuminating as the points of success. 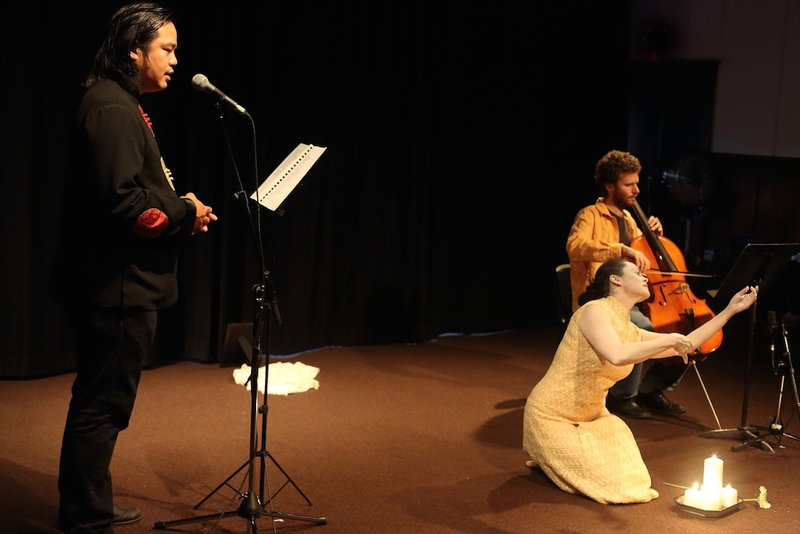 This collaboration features the narrative poetry of Kagan Goh, cello scores by Nicholas Epperson, and Butoh dance performances by Salome Nieto. The four poems alternate between themes of personal tragedy engendered by Canada’s internment of its Japanese citizens during World War II and delightful love stories. The mix is far more natural than these descriptions might suggest. In part, this is a function of Goh’s deft attention to the emotional complexity in each of the narratives, his refusal to write (or to recite) in over-wrought dramatics, and the silver-lined sensibility intrinsic to even his darkest clouds. As he counsels in the poem “The Evolving Flame”, injustice and misfortune must not cause us to “dismiss the happy memories” which also define our lives. Similarly, Epperson gives the performances “movements” a coherence and continuity by establishing and maintaining a strong, evocative soundtrack. The music nicely captures the delicate balance of sweetness and melancholy inherent in Goh’s writing, and the sonorous range of the cello resonates in exactly the right emotional register. 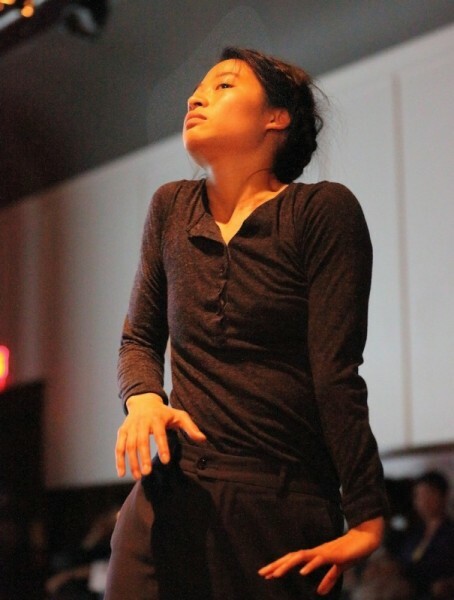 Like Goh’s stories of the Japanese Canadian experience, the inclusion of Butoh feels appropriate to the Powell Street Festival’s Japantown roots, even if Japantown was but a vestige of itself by the time Butoh emerged. And the post-war narratives seem particularly well-suited to interpretation in a dance form that grew from the social turbulence and trauma of post-war Japan. The revelation in Nieto’s performances is the effectiveness with which she deploys this expressionistic style, so historically and ideologically enmeshed in torment and despair, to convey the sweet sentimentality that is such a strong undercurrent in Goh’s stories. If the strength of the dance performance wavers at times, it comes from an unfortunate closeness to the poems, not a distance. 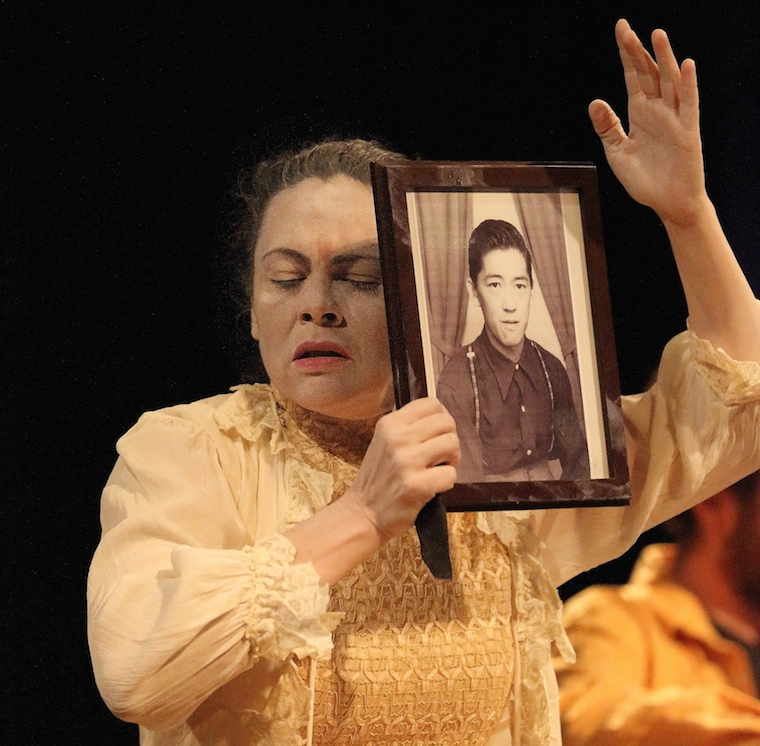 Nieto sometimes cannot resist the impulse to project Goh’s meticulously described tales in pantomime, rather than in the embodied abstraction through which Butoh shines.